The average human heart weighs less than a pound, and yet it is the most important muscle in your body. 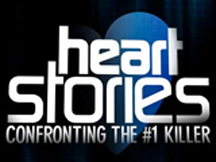 WVIZ/PBS ideastream's Heart Stories: Confronting the #1 Killer, shares the stories of three northeast Ohioans and their family members who have confronted heart disease - the nation's number one cause of natural death. Viewers will follow a man who lives through a heart attack, watch doctors perform heart by-pass surgery, and meet a woman who suffers from life-threatening heart problems. Heart Stories: Confronting the #1 Killer has a story for everyone who has been touched by this disease, and includes the latest information on cutting-edge treatment and research.